The holidays are all about entertaining family and friends and to me that means serving up some good eats! 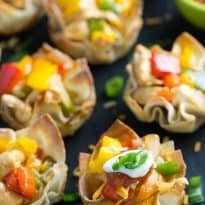 I whipped up a batch of Chicken Fajita Wonton Cups to enjoy as a holiday appetizer. They turned out beautifully and I can’t wait to share them with all of you! They are a bit of a Mexican/Asian fusion theme. 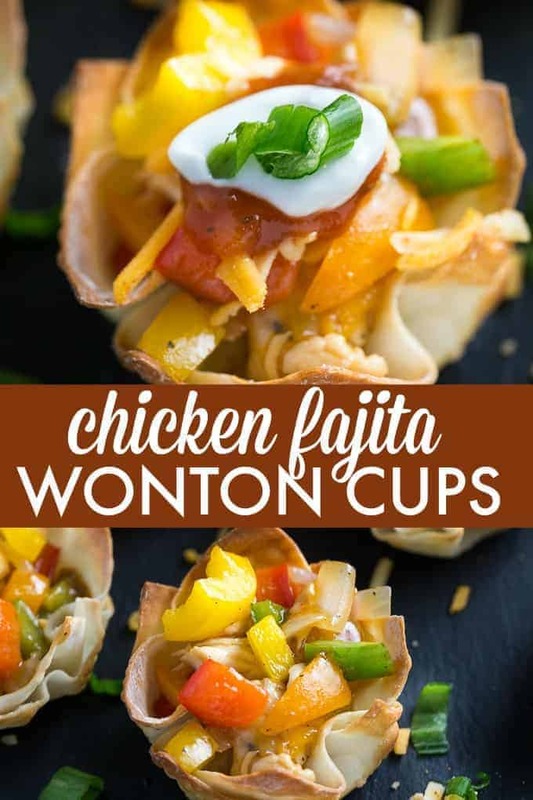 The crispy wonton cups serve as the perfect dish to eat saucy and spicy chicken fajitas. To save time, prepare the wonton cups ahead of time. You could also prep the chicken fajita mix prior to the gathering, but make sure you heat it up before you put it in the wonton cups. It tastes better hot. 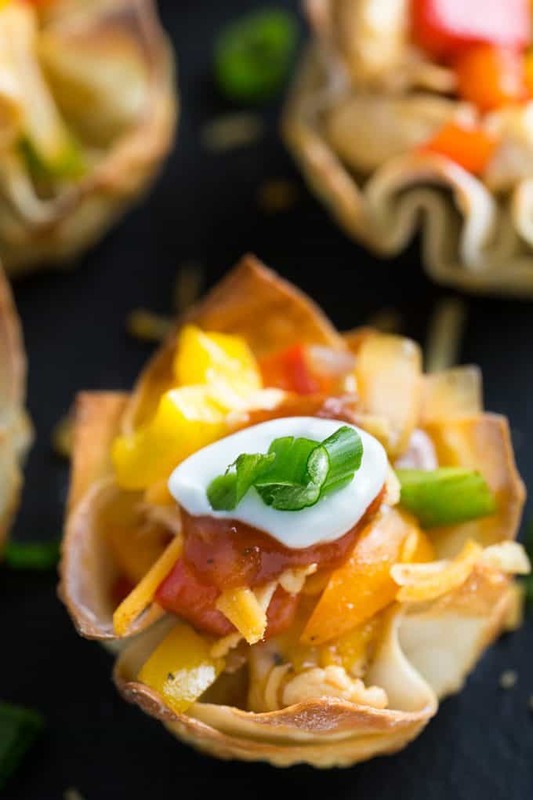 Set out some toppings like shredded cheese, salsa, sour cream and green onions so your guests can top their cups the way they like. I prefer mine with the works with a whole lot of flavour going on. 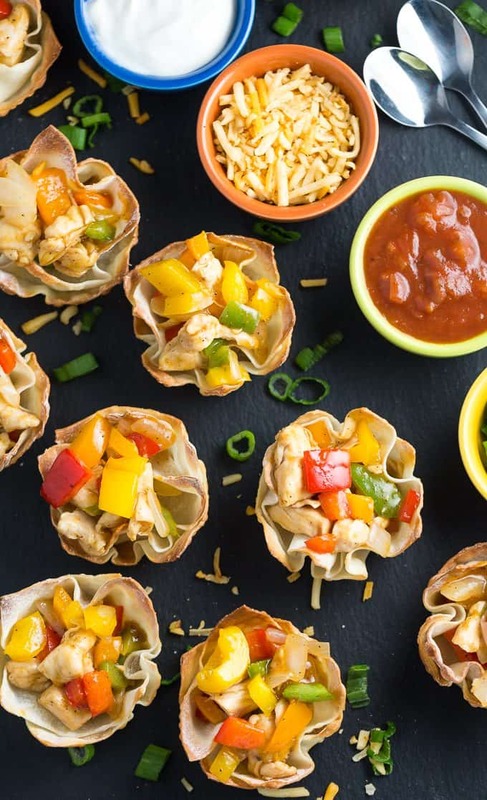 Add these Chicken Fajita Wonton Cups to your holiday menu. You can thank me later once your guests gobble them up. If they are anything like my family and friends, they’ll be asking you for the recipe. I bet they’ll be shocked at how easy they are to make. For more delicious recipes, make sure you visit Chicken Farmers of Canada. They are my go-to source for all things chicken. I’ve made many of their recipes over the past several years and all have turned out fabulous. It’s a site worth bookmarking. Another thing I wanted to mention is their Shopping App. 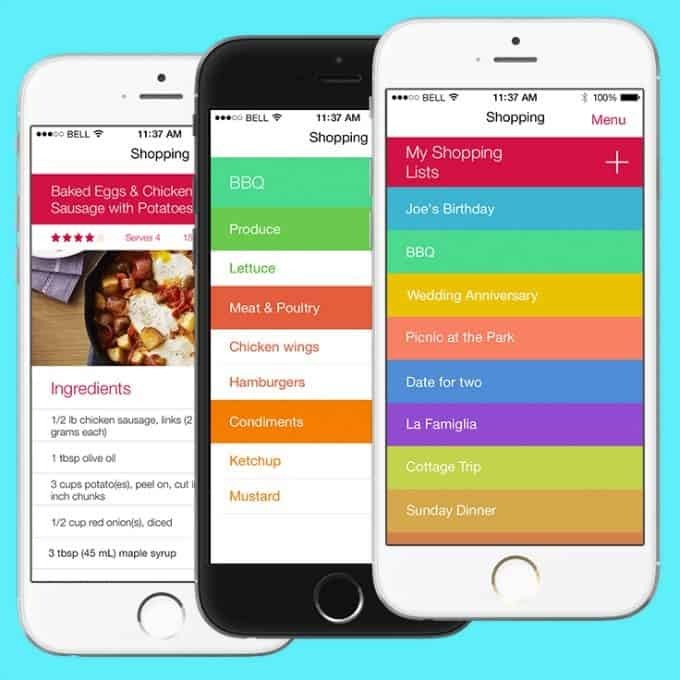 Use it during this busy time of year to organize your grocery list and discover even more recipes to try. It will save you time at the grocery store. With the crowds, I want to get in and get out as quickly as possible and this app helps me do that. What appetizers are on your holiday menu this year? A mouthwatering Mexican/Asian fusion appetizer! You’ll love how easy they are to make for your friends and family to enjoy. Preheat oven to 375F. Spray a muffin pan with cooking spray. Line each muffin cup with a two wonton wrappers each. Bake for 10 minutes. In a large skillet, heat vegetable oil over medium high heat. Cook chicken for 5 to 7 minutes or until cooked through. Add green pepper, orange pepper, yellow pepper, onion and Fajita seasoning mix and stir to combine. Cook for an additional 5 minutes or until veggies are slightly softened. Add 1 to 2 tsp of fajita mixture to wonton cups. Top with sour cream, shredded cheese and green onions, if desired. Those look simply delicious! I just happened to log into my Blogger account and I had followed so many blogs since I started in 2008 and this recipe popped up. I must make it! This is a delicious way to enjoy a fajita. 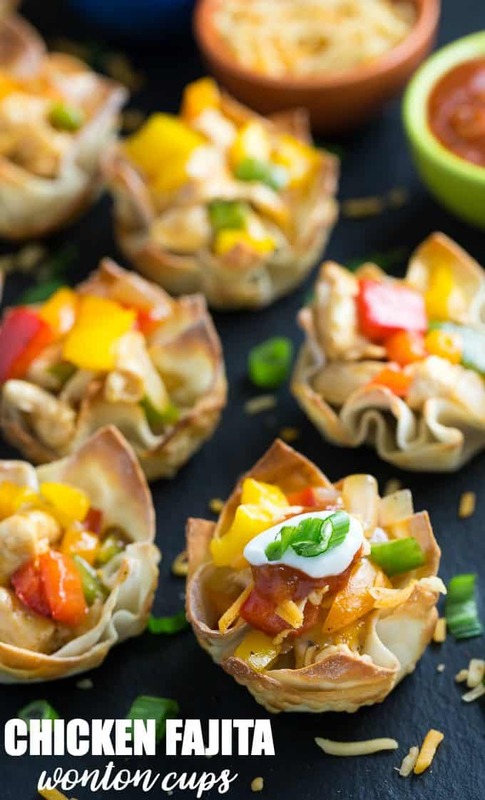 The Chicken Fajita Wonton Cups are a good appetizer to make for my Holiday party. I like how cute they are and they look delicious! These are so pretty and look so good. I may make them for my next potluck!! Great presentation of chicken fajitas! What a creative spin on a classic crowd pleaser! These look delicious! Thanks for sharing. Wow, I love this appetizer. I am pinning and making for a party we are going to have. Thanks for sharing your recipe,i look forward to trying it over the holidays ! This looks so delicious! I love chicken, and Im always looking for new recipes to try. Thanks for sharing this. Im definitely going to give it a shot. These would be great for a party.